Make Your Mark is the annual event with a competition by the London Assay Office to design a piece of jewellery which celebrates the London Hallmark. I was lucky enough to be shortlisted for the Make Your Mark 2019 Awards for my design “Toolery”. Intended as a piece of jewellery for makers to wear themselves, the miniature silver hammer celebrates the tools of the trade and could also be used as a seal to stamp wax, because every tool must have a function! 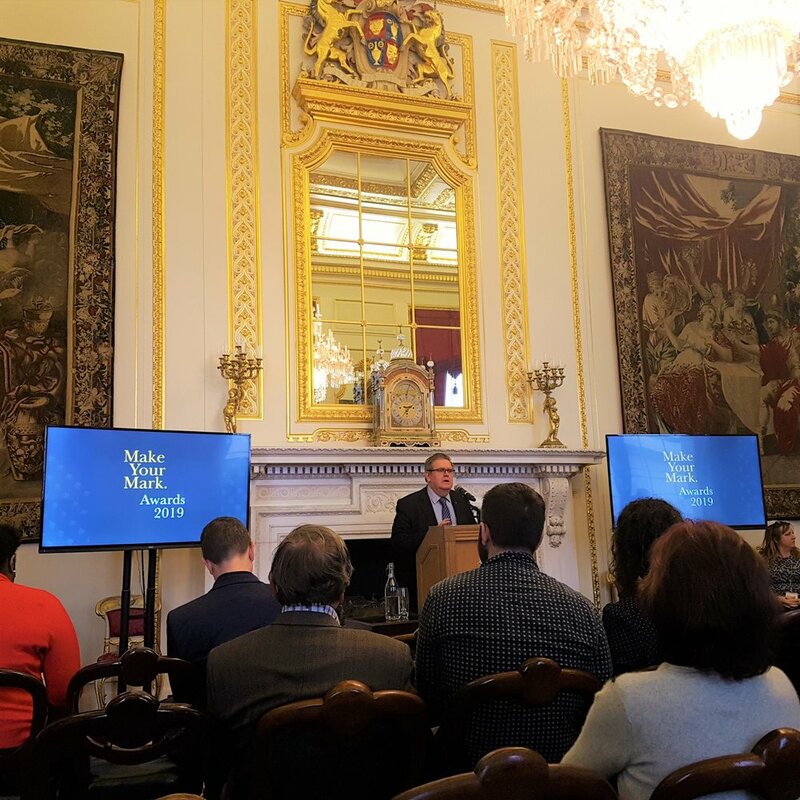 Held at the gorgeous Goldsmith’s Hall which is the historical home of all things precious, I was thrilled to see my design exhibited amongst the other finalists! So thrilled to see my design in such great company! Make Your Mark is a whole day of talks and and demonstrations throughout the beautiful building. Aimed at students, graduates and apprentices it shares information on hallmarking, manufacturing and the jewellery industry to provide a support network which is so crucial in self employment when often working alone. I love the history of hallmarks, their symbols are the secret language of precious metals which can unlock the history of a piece to tell you the story of who made it, the material and when and where it was made. Traditional testing where the item was scratched onto a touch stone and compared to different metal alloy examples. Where the expression, “Coming up to scratch” originates to show you were what you said you were! Stack of wedding bands in different precious metals by my superskilled jeweler friend Rachel Jones who specialised in metal alloys for her MA at the RCA. Even though I have been making jewellery for many years now I had never had my own makers’ mark before as it is only used when making in precious metals which I had not used much of apart from a few components. However this year is a very exciting one for me as I have been learning more technical skills in metal with a fantastic tutor Nina Gilbey at London Jewellery Workshop, so I was able to attend Make Your Mark for the first time this year and register my own unique mark! 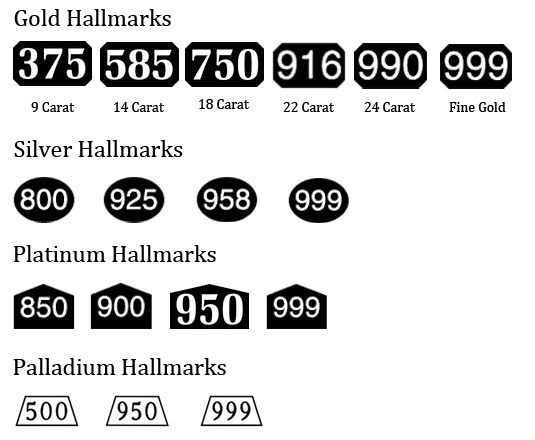 “Every Mark Matters” mine will be my signature stamped (or lasered) on every piece of precious metal jewellery! One of the highlights of the day was chatting to Dave Merry who is a bit of a legend at the assay office having just retired after 47 years (huge congrats Dave!). 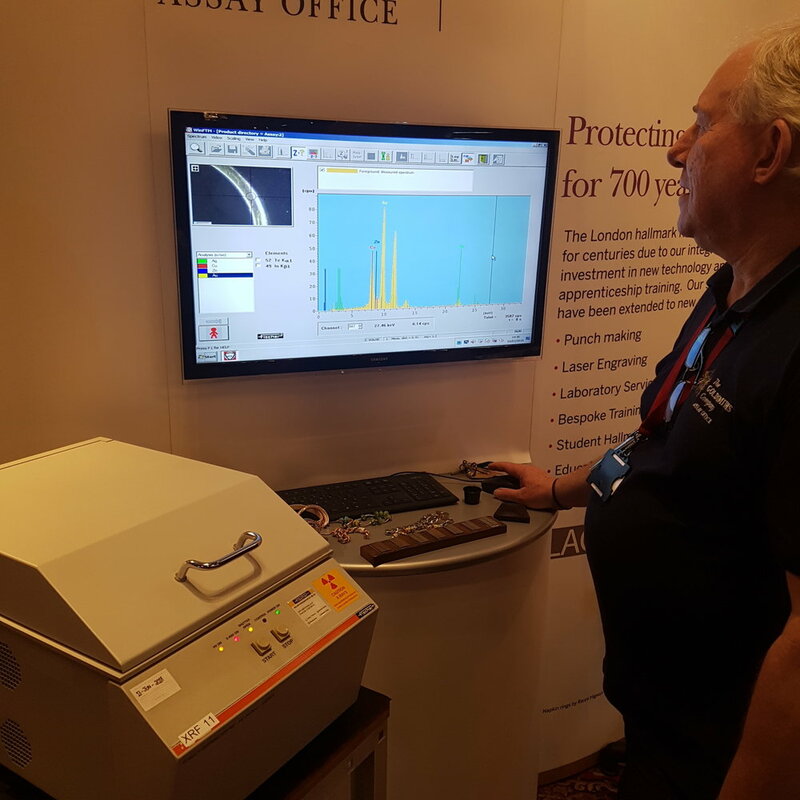 Excitingly we were able to get a demo of the XRF machine in action. The XRF is a low level x-ray machine that is used to test metal items to measure the components giving the percentage content. I had been wondering about my little pinky ring which I bought a few years ago from a vintage market but didn’t have any hallmarks, so Dave said we could test it so it came off my finger and into the machine! 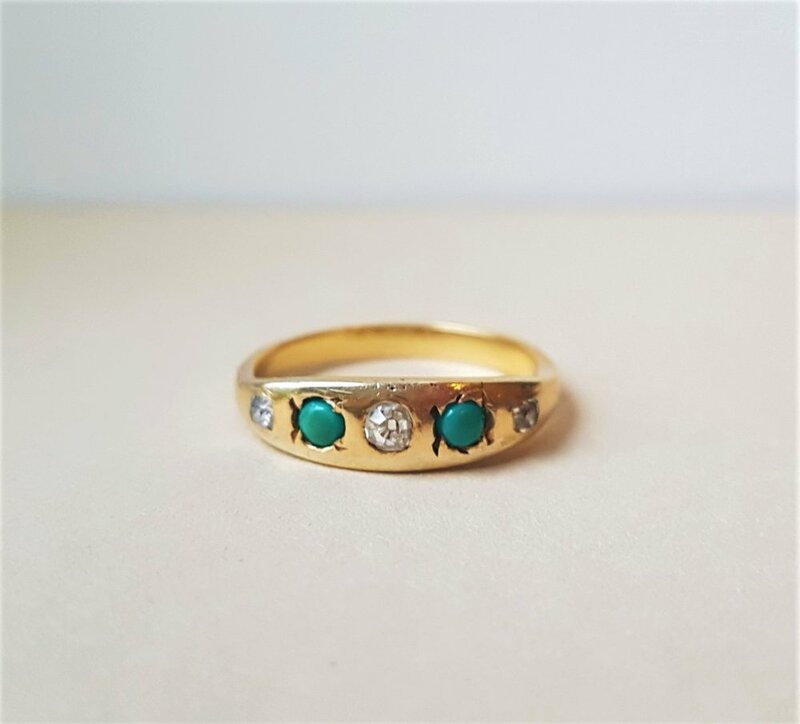 I thought from the style it was probably Victorian, and hopefully solid gold as it hadn’t shown signs of wearing off yet so I thought it might be 9ct but as there were no hallmarks on the ring I had never known for sure what it was made from. 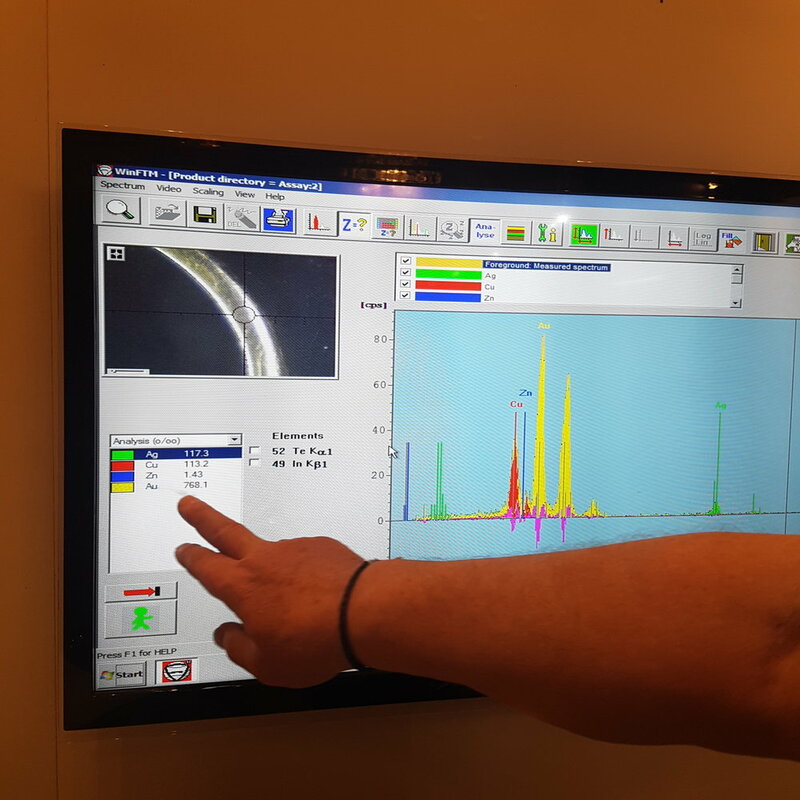 Using the magic of the machine Dave could show me on the graph the exact content of all the metals that made up the alloy. The graph showed Au content was 768-I was thrilled to discover my little ring was 18ct gold! That means it had twice as much “fine gold” in the alloy, which also included silver, copper and zinc and gave it a yellowy colour overall. Depending on the quantity of fine gold and the other metals in the alloy it could make the final metal combination appear more red (“rose gold”) or silvery (“white gold”). “Transition” by Rachel Jones 2018, Over 1.5 meters of wire in a blend of all the full spectrum different alloys from fine gold to fine silver. Usually an object can only be hallmarked with the lowest carat/percentage of precious metal unless they are clearly seperate. Maybe for this special project they could instead have a hallmark added along the wire at different points to show each change in alloy! Look for the Leopard! The London Hallmark. has changed over hundreds of years. and even used to have a regal crown. I love the different expressions too! I am really excited to see my own unique maker’s mark on my first pieces of precious metal jewellery. The steel stamp will be made by hand in the traditional way just like it has been for hundreds of years and hand stamped by hand here in London so it will also bear the famous leopards head! So, it’s been quite a while since my previous post on here! Not to say that there hasn’t been anything to write about, far from it! And I think that is often the problem, we’re so used to packing in so much “goodness” to be productive around our other commitments there is often never enough time to actually enjoy a quiet moment inbetween to enjoy the benefits and soak it all in. I have found instagram to be a good place to share pictures and what I love most is how it connects us, but again that is a fast paced snapshot rather than a place to indulge our thoughts and record our ideas. I am really looking forward to getting back into my “virtual sketchbook” here as a useful to tool to help me disect and digest the discoveries as I uncover them. Thanks again for coming to visit, next time I won’t leave it so long. Life is like a pie…? You know how much I love a food analogy (almost as much as I love food). Well here is a beautiful pie made by my family on a recent visit home. In making a special feast like this, they gather all the special ingredients (this was was mixed game), prepared them and cooked them, even hand made pastry using a recipe they have refined and developed. The finishing touch is the Holly decoration to tie in with the local tradition of Holly Holy Day (to remember a huge battle during the Civil War). After all this effort, it would be a crime to quickly grab a slice and scoff it down inbetween other tasks or whilst on the phone/computer. To fully enjoy a piece of this amazing pie it will be best shared with our loved ones, eaten slowly to appreciate each tasty morsel which has come together with skill and science. Allowing the time to sit down in a comfy, cosy place we can then digest it properly to get all the benefits (and avoid indigestion!). If we can do it with a pie, we really should do it with the rest of our creative life too! I love the shapes and patterns formed by shells but I'm always aware of their brittle nature. Using my processes, by capturing their forms and recreating them in resin they can become wearable objects to enjoy everyday. 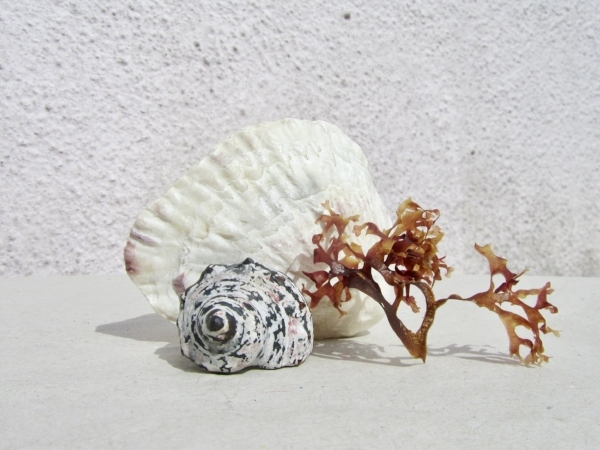 Ring and Barnacle Bracelet from "Conchology"
These one-of-a-kind pieces are formed in the shape various shells making them out of solid resin layered by hand, painting and blending delicately in blushing colours in homage to the real beauties of the ocean. Studying their patterns and recreating their hues gave me even more appreciation for their delicate nuances of colour and texture. I found that the process of patiently layering often barely perceptible gradients of colour for this series a very meditative process. These new pieces are all in my shop, plus a few others. I hope you enjoy looking, and please get in touch with any bespoke ideas and I'll be happy to chat more. Ambrose Degeneve, Anne Milbeau, Catalina Brenes, Chiara Scarpitti, Diederick van Hovell, Emily Thatcher, Jo McAllister, Laura Forte, Marie Guerrier, Yasmin Yahya. It is a great chance to cover any naked fingers in some statement jewels! If you haven't heard already, there is a fantastic opportunity to be in Nicolas Estrada's upcoming book NEW BROOCHES! The Barcelona jewellery aficionado is well known for his excellentpublications celebrating contemporary jewellery. Always a feast for the eyes and inspiring for the mind. Time is running out as the closing date is 30th April, so calling all jewellers - apply HERE! But what about his amazing jewellery? Photograph by Alexander English "The Boldness of Calder"
The wearable pieces Calder produced are key to his practice and Louisa Guinness Gallery has curated the perfect showcase in this new exhibition: The Boldness of Calder. Calder's jewellery is so exciting because it allows the wearer to become a part of his kinetic art. Alexander Calder Brass necklace in "The Boldness of Calder"
We know how emotive it can be to observe a piece of sculpture or a painting, but what about being a part of it? Wearing these pieces would certainly have an impact on how you felt and even how others behaved towards you. Some of the pieces are very armour-like. Often in textured metal, but sometimes combining wood and textiles these are sculptures to fit around the body, en-robing, entwining and exaggerating the form with angular points or delicate fronds unfurling. Calder's tribal influences can be clearly seen in his jewellery. The red velvet displays at The Boldness of Calder add to the feeling of ceremony as if the pieces hold their own ancient power to bestow on the wearer. White photography backdrops also hang in rolls from the ceiling as if we've walked into the middle of a shoot. 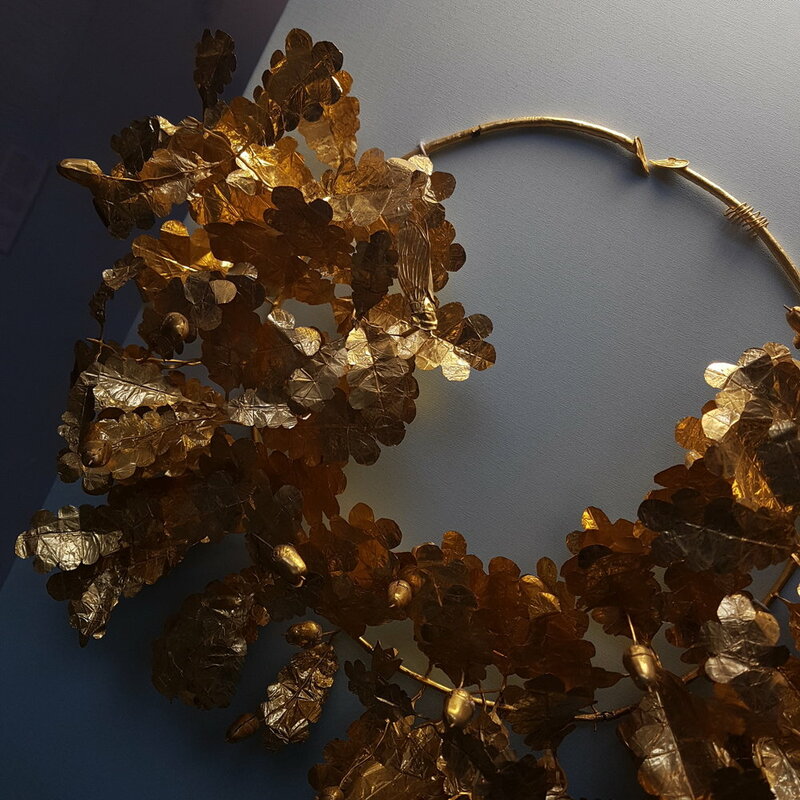 This keeps a clean, minimal aesthetic and it is a simple yet fitting environment for the jewellery which itself seems simultaneously both ancient and new. These pieces were made by Calder in the 30s and 40s but are just as boldly unique, desirable and exciting as ever. There are some beautiful photographs of famous women wearing Calder pieces through the decades; Georgia O'Keeffe, Anjelica Huston, Peggy Guggenheim and Brooke Shields. A chic combination of fashion and art; I also remember a golden cuff by Calder being name checked by the artist in Truffaut's 1968 cult film "The Bride Wore Black". New photographs were commissioned for the exhibition, captured by Alexander English styled with fashion designer Elise Overland. The stunning images hark back to the clean elegance of mid 20th century photography with a contemporary, modern edge. For more information on this great exhibition, you can get in touch with Louisa Guinness Gallery. This is a rare chance to see this work all together, especially so close up, I'm sure I will have to pay another visit soon! Here's a very brief overview of some of the steps involved in the lost wax casting process. The Applied Arts course at North Wales School of Art & Design is really hands on with teaching and practising important processes like this. Their focus is "on the high quality craft skills needed to be a professional maker". Spruing-up with thin rods of wax makes a tree like structure which will allows the molten metal to flow into and fill the cavities. Taking your organic found objects or wax shapes you have made, you have to connect them to a wax tree with little wax branches called "Sprues" all pointing "Up" so that when turned upside down the metal flows down into the spaces left after the wax melts. You want the sprues to be as thin and delicate as possible when working on small scale castings as they will also be "transformed" into solid metal and you will have to cut them off where they are attached and clean up your castings. This makes "spruing up" quite fiddly and takes longer than you think! You need a steady hand and plenty of concentration when melting and applying the wax sprues. When your tree is finished and all the parts are secure it is fitted inside a flask. Next is a crazy process which is all about precision and timing! You have to mix up a bucket of special investment plaster, carefully weighing up the quantities, making sure everything is clean and uncontaminated. The plaster starts to harden very quickly so processes need to be followed really carefully and quickly, so just like a TV chef you need to know the "recipe" inside out and have all of your things weighed out and everything to hand. However, instead of putting your "mixture" in the shiny oven in your glamorous chef's kitchen, the flask of plaster goes into a vacuum chamber to get rid of the air and ensures crisply defined castings. After the specified time in the vacuum, the flask goes into the kiln overnight. This will burn away the wax and organic materials leaving the cavity to then fill with molten metal. Now you can prepare your casting metals. These have to be weighed out depending on the weight of the flask and how big the castings are going to be. Accurate measurements are really important. If too little metal is melted then when it's poured in, it won't fill out the cavities, meaning your one-off castings will be sad and empty or partially missing spoiling your hard work from the previous day! Casting grains of silver go into the crucible to melt ready to pour into the mould. Lovely brass for brass castings. You can see the chopped up "sprue-trees" leftover from a previous casting to be melted and reused in this casting. Working with hot metal is dangerous, so safety equipment and the right tools are needed to protect yourself and those around. And maybe a nice cold drink for afterwards, as it does get VERY hot! When ready (again, timing is everything so follow instructions and have accurate timers), the flask is plunged into a bucket of water. This causes the special plaster to fizz and bubble dramatically like a volcanic geyser so it's very exciting! This reaction means that the plaster should dissolve and break away leaving the metal casting to be cleaned up. It's like excavating your own fossils! Silver casting of wax rings by my sister Julie Mellor. Brass casting of plant stems collected by my sister Rozanne Mellor. Now the castings can be sawn-off by hand, cleaned up and transformed into whatever you have planned for them! I hope this shows what an exciting and involved process casting is! For more information on the facilities, Open Days and courses at North Wales School of Art & Design at Glyndwr University check out their website or message them on Twitter: @NWSADAppliedArt . After my research trip to The Natural History Museum in London, I travelled up to Wrexham in North Wales to visit Glyndwr University North Wales School of Art & Design. Their jewellery and metal work department for applied arts is really hands on, with access to some fantastic techniques and equipment-a jeweller's dream! One of the most exciting processes available to students at Glyndwr is investment casting, also known as "lost wax technique" or "cire perdue". This is one of the earliest forms of creating metal objects in civilisation, first used at Nahal Mishmar - “Cave of the Treasure!” This important hoard of early metal objects was only discovered in the 1960s when looking for the Dead Sea Scrolls! Although an ancient method, it is a complex process creating very precise works to capture tiny details of organic material or finely crafted masters carved in wax or a substance that burns away to leave the cavity which becomes the mould. This is what makes the creation of a mould for investment casting similar to how a natural Epimorph forms. In an Epimorph, the “mould” is a mineral, capturing the shape and texture of the original mineral it has grown around, which naturally dissolves away. In the lost wax casting process, the mould is made with special investment plaster around the desired object you wish to capture the form of. Many commercial and contemporary jewellers use casting, but as the process requires so much specialist equipment and is such an involved process, it is usually sent away to a company such as Weston Beamor who've been producing high quality castings for over 60 years. By doing so you pay for a mould and can use for repeat castings which is more cost effective and consistent to reproduce. One of my favourite artists, Momocreatura makes exquisitely grisly silver jewellery. The fine detail is carved in the original wax with a pin! The benefit of learning to perform this process yourself from start to finish teaches you an understanding about casting. This means if choose to send pieces to be cast by a company in the future you will appreciate the process and know how to get the best moulds and as a result best casts for your work. Also, who wouldn't want the opportunity to cast their own treasures in the workshop! It is a chance to feel like a real life alchemist as you see the original object go into the flask to then appear in the end "transformed" into precious metal! Casting - feels like real life alchemy! I'll break down the process step by step in my next blog post! Many thanks to Glyndwr, North Wales School of Art & Design for their time during my visit. If you would like to know more about their Applied Art opportunities get in touch with them to find out about Open Days and course availability. I spent last Saturday at the Victoria & Albert Museum's "Study Day" of lectures in celebration of the new publication London Couture. See a glimpse of the beautiful new book here . Firstly Amy de la Haye set the scene to give us an idea of who these early couturiers were. Courturier was a legitimate career for a married Edwardian women, or a road to independence and success for a divorcee. Kate Reily was an example of a shrewd business woman using her creativity and cunning to keep up to date with the thirst for the latest fashions. Even though Reily's original designs were highly praised, the British customer only had eyes for Parisienne models. In attending the show, Reilly would be obliged to purchase at least one model, but to get the most from it, she would send two buyers to view the new designs. With the idea that two heads were better than one. they would dash back to the hotel to sketch what they had seen to reproduce for their own customers on their return. We learn of prestigious dressmaker, Madam Clapham of Hull who made a point of not paying her apprentices as she wanted girls from "good families". She felt that those from a wealthy family who could support them, they would be a better class of trainee. Sadly this excluded many talented individuals born without a pair of silver scissors in their hands, unable to learn by working full time for free. This is still affecting the fashion industry today. Many designer brands have been criticized that their unpaid intern-ships are elitist, allowing only a lucky few from privileged backgrounds to gain valuable experience with them to get the best start with their careers. 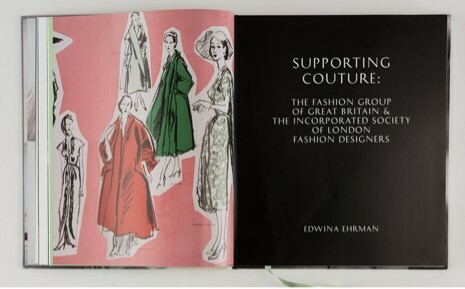 Edwina tells us of the shift in dressmakers of the 20s and 30s. The new favourites were young men like Norman Hartnell with a creative approach and an understanding of the glamorous lifestyle of their clientèle. These men socialised with their patrons, a complete contrast to the couturiers that pre-dated them who were so intimidating to wealthy out-of-towners they would often turn to department stores rather than seek out an illustrious dressmaker and face their scrutiny. The iconic CC41 label, also known as "The Two Cheeses" there was also the double 11, much rarer and introduced to signify a finer quality item. Look out for these when out vintage shopping! "34 utility garments suitable for mass manufacture in order to demonstrate how high-fashion elegance could be achieved within the strict rationing restrictions"
Parallels can be drawn to modern high street giant H&M's collaborations with elite houses and designers like Margiela, Stella McCartney and Karl Lagerfield bringing their signature style to a mass market on a global scale. (You can view previous H&M collaborations here). The most recent collaboration with Balmain has even seen their sell out pieces fetch more in online auctions than original Balmain garments! "Revealed this morning in all its embellished, whipstitched, skintight glory and, as expected, there's not one item that hasn't got wish list written all over it." H&M fans have complained that the retail prices of the Balmain collaboration are too high, going into hundreds for some of the more embellished and leather pieces, which is a big step up for a high street chain with average prices usually at £14.99. However even a few hundred is still a fraction of the thousands that the official couture collections from Balmain can cost when bedecked in the finest materials. This is something Joyce Fenton-Douglas brought up when talking about the Ancillary Trades. Couture dressmakers relied (and still do) on the Ancillary Trades for specialised skills, such as pleating, embroidery and embellishments. Rather than just the finishing touches, these can be the most desirable aspect of a whole design or be the structural basis for a garment. These can provide the instant wow factor that gives you the fist sign that this is a special, more luxurious item. This charming video below was brought to our attention in the lectures. It shows the Australian maker Harry Nairn hand cutting, shaping, dying and assembling all the individual parts of a silk flower in his own workspace at home. Couture houses would historically send "matchers" to the addresses of specialised makers. These girls would seek out matching flowers, trimmings or other embellishments in the very particular shades or styles necessary to co-ordinate with the fabrics for the garments. The names and addresses of the top artisans would be their best kept secrets to give them the winning edge against competitors. Although flattering, this was unfortunate for these highly skilled individuals, trying to maintain a living by providing an already niche service. Harry Nairn who makes intricate artificial flowers. We see him cutting out petals, colouring them, shaping them with a heated metal tool then crimping petals. We see a pink rose taking shape as Harry moulds the petals around wire. Joyce did highlight the fact that today's top couture designers will still work with modern artisans for these embellishments, utilising very labour intensive techniques. This gives them the maximum impact for the catwalk as well as distinguishing them from the follow-on designer copies which although can often get a close general look, will never be able to feature these specialist skills which take such a long time to produce in the originals. The women who can tell these extra special pieces from the inferiors are the subject of Beatrice Behlen's talk. We learn of the rarity of these couture clients which the industry relied on and the relationships they had, often choosing only one particular couturier. Being polite and prompt payment made a client very liked and appreciated. The couturier would send sketches of the design to their clients for their approval receiving back comments such as "Like V.much" or "Nice, but what's the Price???" Beatrice was even able to trace the life of one such client, Lady Fox, using society columns alongside the garments she had procured to see her defining style as a textile timeline to her life. As an early adopter she knew her stuff and designers would rely on patrons like Lady Fox to invest in their work. The term "working wardrobe" came up quite often in these talks. For these women it was part of their lifestyle to have these clothes, fit for the purpose of each area of their lives, whether it was salmon fishing in the Highlands or cruising along the Dalmatian Coast. Although extravagant in our terms the cost of these pieces meant they would fit well and be made of the best natural materials or heritage fabrics, returned to year after year so they would have to last well. Timothy told us how he originally delved into the world of couturier Charles James after discovering a collection of his garments wrapped up on mannequins in an archive he was working in. Without formal dressmaking training Charles James had a unique approach heavily influenced by his millinery experience. We learn that to create his amazing garments, James would create hand sculpted abstract forms more like a block or last than a mannequin. By using these to create a garment it would have unexpected and new shapes, fitting the body in a different way than conventional dressmaking which relied on padding and corsets to fill and fit the body into a desired shape. Charles James also used hidden architecture but with alternative materials for a new spin. Structures were formed by heating plastic to mould and form the unusually shaped skirt as seen in his famous "Clover Leaf" dress formed into the four portions of the leaves. Charles James "Clover Leaf" Dress from 1953. To gain insight into the internal structures of these magnificent shapes they even used technology such as hospital scanners to discover the secrets used by the celebrated dressmaker. "Make The Grain Do The Work"
These garments were thoughtfully engineered, and this combination of vision and technique along with the support socially from Cecil Beaton and the wealthy friends of James' Mother gave him both the exposure and clientèle for his unique designs. For all the appeal of couture as a sight to behold, the "London Look" was never going to last and this was explained by Jonathan Fairs. The "uniform" which was relied upon to give strength and order to British society during the Second World War was no longer required. Using examples from the media coverage of couture in the mid 20th Century we can see how although beautiful, the elaborate gowns and traditions they represented were out of place in this post-war era. One iconic editorial photographed by Clifford Coffin shows elegant models poised amongst the bombed out structure of a London mansion, intended to be "still standing strong & untouched" by the war but instead they appear as if haunting the desolate space as beautiful ghosts of the past. New designers were setting up their own ready to wear boutiques. Rather than the high price demanded by fine, fashionable garments, the 60s sought a new cutting edge of style where being made quickly was a bonus rather than a sign of inferiority. The quick turnaround meant it could be seen on TV and bought the next day. Instead of being confined to the high spends of the rich these new fashions were available for anyone brave enough to wear them creating new fashion muses and customers in a world outside that of the débutantes at their elite functions. It was a free for all with young girls earning their own wage to buy their new clothes or even steal them in the famous Biba store where it was almost too easy to shoplift these must have exciting pieces, made for the rule breaking youth culture. These women wanted to make their own future and forget the past. Biba founder, Barbara Hulanicki was the eldest of three girls, raised by her mother and aunt following the assassination of her diplomat father by paramilitaries. “It was meant to be for girls in the street. They were earning money and they had nowhere to go. " As in the overview from the corresponding lectures The V&As new book London Couture shows us many of it's historical aspects. For an industry which catered to the very rich and relied on highly skilled specialists we see how Britain firstly followed, then lead triumphantly, and eventually faded as the times changed and people's needs also. But London is a thriving city of Fashion, so what can we learn from London's Couture past to use today? Although only worn by the few, couture can inspire a generation: proof of which is the sell out Alexander McQueen exhibition Savage Beauty at the V&A this year. Good quality lasts: vintage fashion has become a whole industry in itself, with concessions in high street giants like Topshop and even huge standalone stores, with branches in multiple cities like Cow. These pieces have lasted, can we say the same will be seen of some of the the cheaply made clothes we buy in bulk today? Although few of us can afford the luxury of couture, we can take a lesson from the way these women built their "Working Wardrobe". In resisting a few more of these it may result in affording a smaller, yet much more usable & better quality wardrobe to look and feel our individual best, which to me is a bit of British Luxury we all deserve.